Nolan Arenado. Credit: Isaiah J. Downing, USA Today Sports. Nolan Arenado is fed up with losing, and that’s a terrible truth for the Colorado Rockies. Yesterday, after narrowly avoiding being swept by the Giants in San Francisco, Arenado told The Athletic he needs to win. For a team like the Rockies, who are celebrating their 25th anniversary, superstars have come few and far between. Larry Walker, Todd Helton, Troy Tulowitzki and now Arenado are the shortlist of those superstars. No offense to any of the other Blake Street Bombers or anyone else left off the list. Elite means just that; the cream of the crop, and the Rockies’ list is only four-deep. Simply, the Rockies — who have historically underspent on players’ salaries, even if that trend was bucked a little this year — cannot afford to lose Arenado. Period. For those of us who watch Arenado day-in and day-out, it’s incredibly difficult to find another third baseman who plays the game better. When it comes to playing in the field, at the hot corner, Arenado has won five straight Gold Gloves, and he’ll likely win a sixth straight this year, his sixth in the league. His .974 fielding percentage is currently second-best in the NL this season as well. 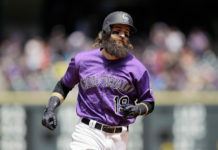 Offensively, his 19 home runs are tied for the NL lead, while his batting average (.308) and slugging percentage (.584) are each sixth-best in the National League currently. 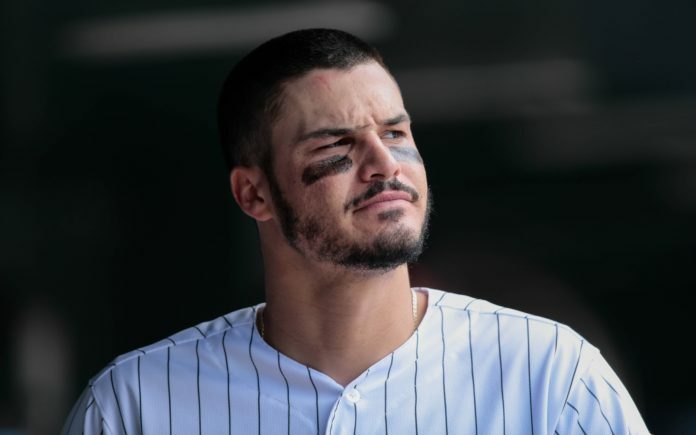 Arenado is the Rockies’ superstar — no slight to the stellar Charlie Blackmon, but Nolan is better and more important — and his story is beginning to bring back memories of another infielder who grew tired with all the losing, Troy Tulowitzki. Tulo was drafted by the Rockies in 2005 and played with them from 2006 through he mid-way point of the 2015 season, when he was traded away to the Toronto Blue Jays. The first half of his time in Colorado, Tulo was a superstar, helping lead the Rockies to two playoff appearances, including their only World Series in 2007. In the second half of that tenure, Tulowitzki simply couldn’t stay healthy, which should be considered a differentiation of the two superstars, as Arenado has played 133-plus games in four of his five seasons. The Rockies also knew Tulo was growing more upset over losing because he said it in the media. When ROOT Sports Rocky Mountain (now AT&T Sports) used to run a promo before games, there was a question with Tulo asking him if he loved winning or hated losing more, and he said he hated losing even more than the joy of winning. When he was finally traded away in 2015, Tulowitzki said he was shocked at the move by the Rockies. But, he also kind of burned the organization on his way out the door. It’s no secret the Rockies have been cheapskates when it comes to spending on player salaries over the years. For Tulo’s first eight seasons, they only spent more than $100 million once, in 2010. Recently, they’ve done better — their $139 million opening day payroll was 14th this year — but simply throwing money around, at the wrong players, doesn’t build a winner, either. The Rockies have wasted money on Ian Desmond ($22 million in 2018), Bryan Shaw ($7.5M), Jake McGee ($7M) and Mike Dunn ($7M), among others. 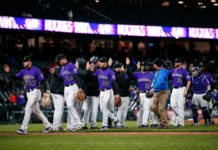 Dunn (9.00 ERA), Shaw (7.57 ERA) and McGee (5.70 ERA) are mostly what’s wrong with the Rockies repulsive bullpen which has cost them multiple wins this year already, at the halfway point. And Desmond has been one of the worst batters in the entire MLB this year, and the worst on the team (.215 BA, .295 OBP). As cheap as Dan O’Dowd was, for years and years, Jeff Bridich is at least, getting the Monforts to open their cushioned wallets and pay for players. Unfortunately, Bridich has bellyflopped on his biggest signings. Those giant gaffes on pitchers’ paychecks are killing the Rockies chances of making the postseason. Remember, in May, Colorado led the NL West for 10 days. In June, it’s been a rocky road to say the least, going 9-16 overall and now they’re 8.0 games back of the Diamondbacks exactly halfway through the season. 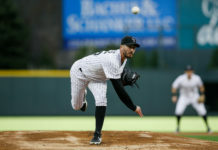 For Bridich, his mistakes on Desmond and the bullpen have probably sunk this season, but if he can’t figure out a way to create more wins on the diamond, his tenure as Rockies’ GM will be defined by losing Nolan Arenado.